I am not a master of conflict resolution. Okay, that probably seems like the wrong way to start a series of blog posts on overcoming conflict in the work place. But I don't think that it is. Why? Because MOST of us aren't experts in conflict resolution. We all have challenges, we all have fears, and we all have faced our fair share of conflict over the years. Having experienced a ton of conflict does however make me well aware of good ways to approach it - that can amp up your success and ways to approach it that can limit less than stellar results. What follows is the result of a lifetime of facing conflict, running from conflict, and conquering conflict. This series of posts will focus on a process for overcoming conflict - how to prepare for and execute successful conflict discussions. And it begins with a simple phrase that we all have said and thought as we've faced conflict. It is also this phrase that makes it instantly identifiable, memorable, and helpful when you need it most. And if you think about it, isn't that what conflict boils down to? Needs not being met? "I need more time." "I need you to quit interrupting me." "I need you to get me those reports on time." More specifically than just "I need" is what it stands for - in this case, "I. N.E.E.D." Is the issue you have a "Who" or a "What"? You need to determine if you are having an issue with a person or a situation. This should be obvious, but sometimes our initial instincts on this are off so it's worth taking the time to think about it. Next, what is the behavior/action/situation that is bothering me? Here you need to identify what exactly bothers you - and you need to focus on this because, later, when you start speaking to the person that you need to about this issue - you want to discuss the facts not attack the person. Blame will only make people defensive and make the journey to conflict resolution that much harder (if not impossible). Does this need to be said? If you are having a problem with someone, do you NEED to say something? Is it really that serious? In a year will you care about this? If so, move on to the next question. Does this need to be said by me? Am I the right person to bring this up? Odds are the answer here is yes, but you never know. Some issues may need to be addressed by another employee or individual in your life. However, if you determine that you need to be the one to say something, you can graduate to the next question. Does this need to be said by me right now? This is key - in this moment, should you be talking about this with this person? Is it a good time - are you too upset? Are they in the middle of a key project? Should you wait a day or two to cool off and get perspective? Once you have successfully answered "Yes" to the above questions, it's time to move on to a word of caution. If you've read "7 Habits of Successful People" you know that one of those habits is to begin with the end in mind. This is valuable advice in any situation, but here, you need to be a little careful. We need to add a phrase to that to make it more helpful for conflict resolution. Begin with the end in mind but be willing to change. We'll talk more about this in a later step, but it's important to plant this seed now. Okay, now that you've completed the "Identify" step and you know who and what is causing conflict, it's time to dig a little deeper. 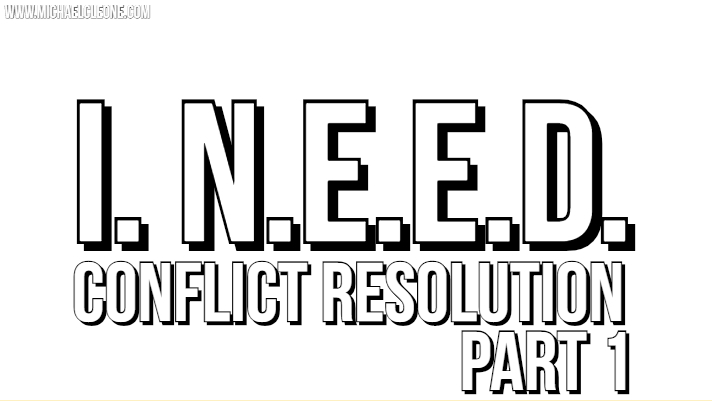 We'll move on to the "Need" section in next week's post which focusses on what you need in order for this conflict resolution to come about. Until then, make today great!